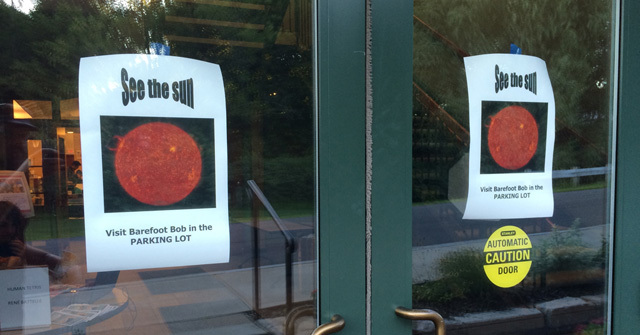 Bob Piekiel and I have continued to make the most of the Summer for hosting observing sessions. While the Sun is good anytime, the Summer Nighttime Sky certainly makes for a worthy complement to our Winter sessions. Instead of crisp, clear (and cold!) conditions and close-ups of some of the most impressive objects in the Nighttime Sky (everything in Orion alone is worth dressing up for), we trade boots for sandals (or less), slap on the bug spray, and scour into the heart of the Milky Way for a host of fine objects to our zenith and points south. As Summer weather is also easier to brave for most, we enjoy larger turnouts and introducing others to the greater outdoors. 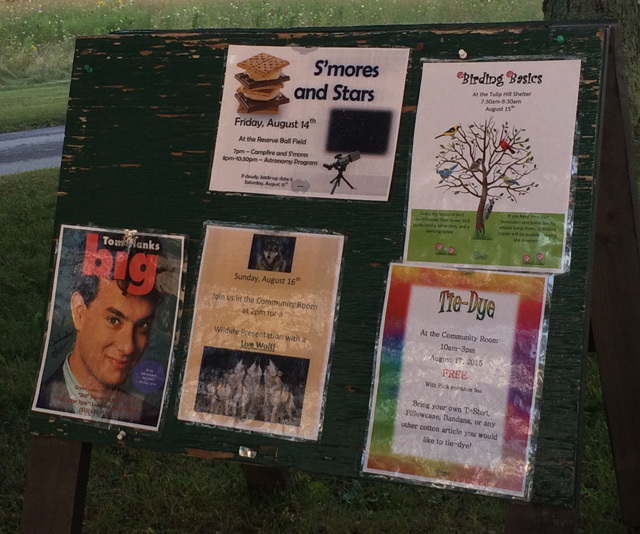 Clark Reservation, 18 July 2015, 1 to 3 p.m. 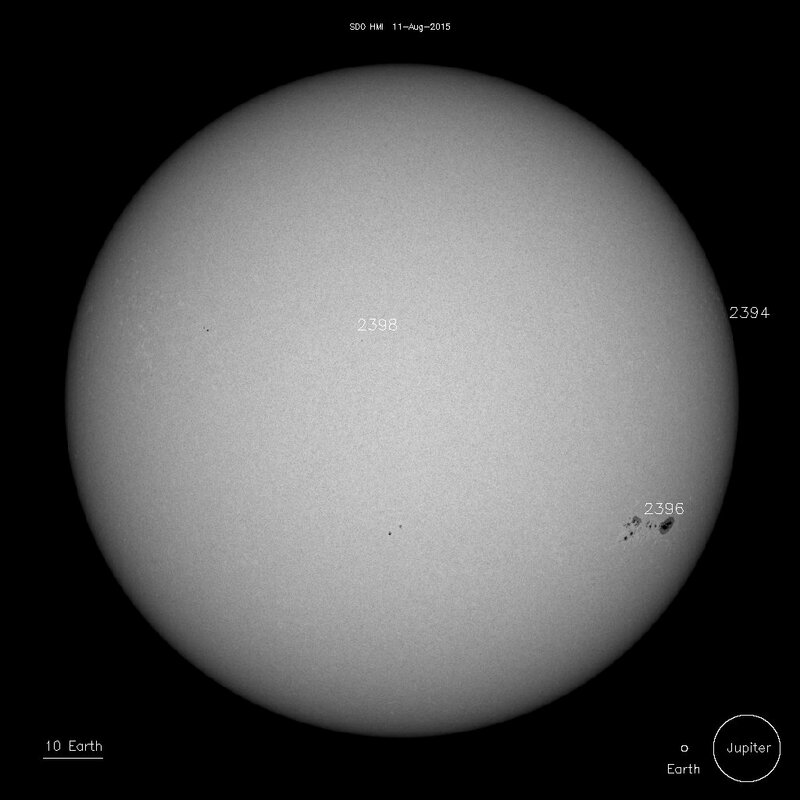 While the Sun is always busy, those phenomena which causes us to spend beaucoup bucks on equipment were in short supply on the surface that afternoon, with tiny-ish sunspot 2386 the only significant feature to scout around. The presence of Bob’s Coronado H-alpha, He, and CaK scopes did noticeably open up the feature window for some of the more subtle objects. Bob and attendees at along his observing array. The whole session ran a hot two hours. 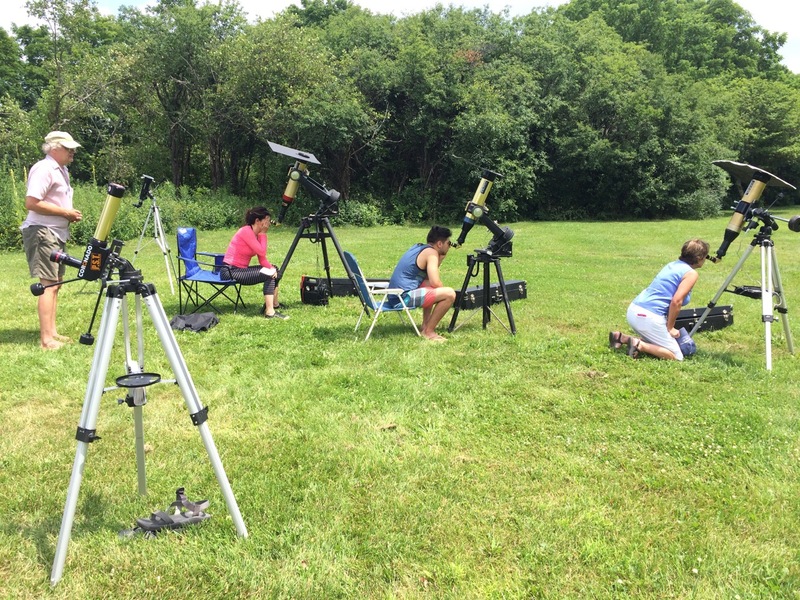 About 15 people made rounds to the scopes, with a few people making second rounds (some to see again, others returning after some of the clouds had moved on for their first viewing). As a true testament to Syracuse weather conditions, we went from blue sky to heavy cloud cover to a quick sprinkle and back to blue sky in a 10 minute window at 2:30. Baltimore Woods, 18 July 2015, 9 to 11:30 p.m.
Unfavorable conditions Friday night made for a Saturday observing double-feature. 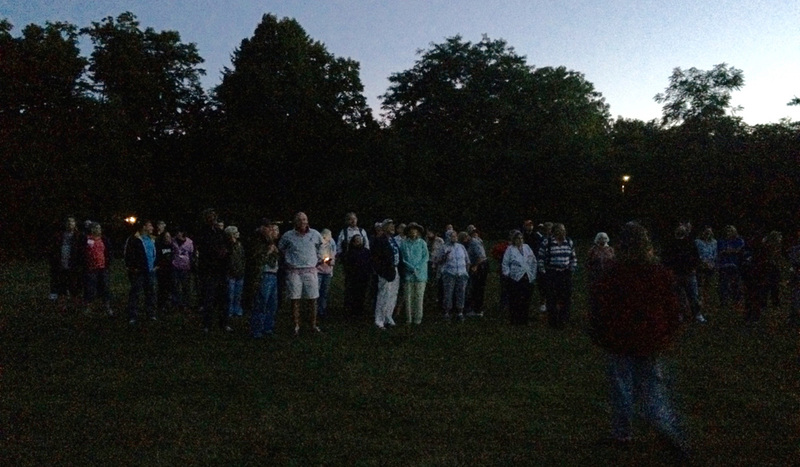 We had some hold-over from a Baltimore Woods concert (featuring Joanne Perry and the Unstoppables) that ended at 8:00 p.m. (while it was still far too bright to do any observing. Even the Moon was a tough catch) and a patient wait for, um, one person’s mirror to warm up after a heavily A/C’ed drive from downtown Syracuse. 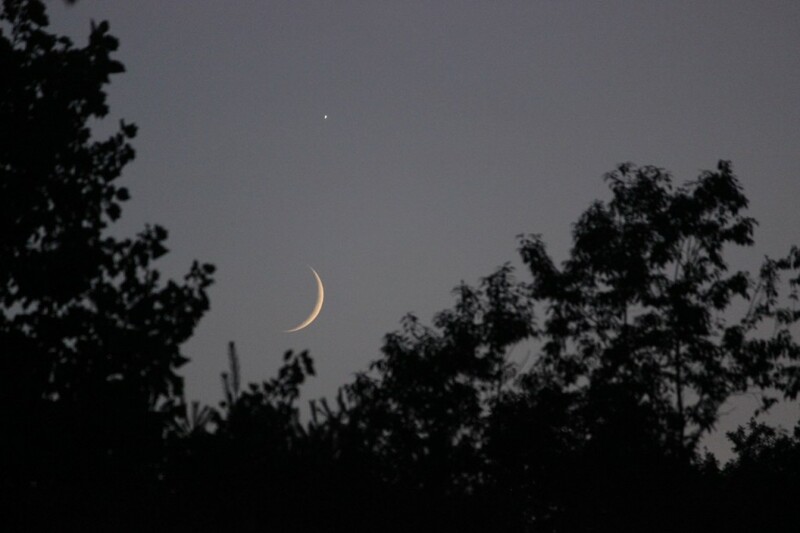 Venus and the Moon caught just at the tree line. The elongated view of Venus is not an exposure artifact (1/200th second at that), but is because Venus was, at that time, a medium-thin crescent. Click for a larger view. The evening turned out excellent for Public Viewing. Venus and the Moon (see above) were an early, close catch due to the high summer tree line (Jupiter was too far below the tree line by the time it was dark enough to be interesting in a scope, although Bob did get one quick view of it earlier after aligning his Celestron Nexstar), after which Saturn, Antares, and Arcturus were the next catches. 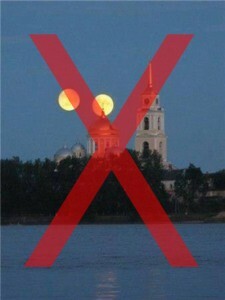 * Saturn – Several times for several waves of attendees, and the Summer and Fall’s highlight planet. * Albireo in Cygnus – Part 1 of a “test your retinal cones” survey, with everyone able to get at least a little orange and a little blue out of this binary. * Zubeneschamali in Libra – Part 2 of a “test your retinal cones” survey. 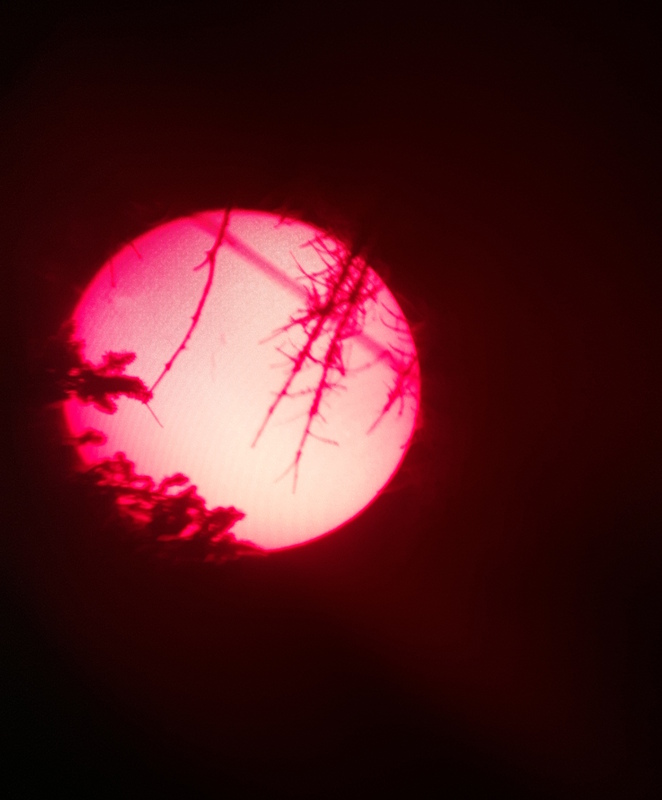 Bob, er, found a way to get 100% agreement on the apparent green-ness of this star (a much better percentage than at our Green Lakes session), courtesy of a particular screw-on filter. * Herschel’s Garnet Star in Cepheus – Part 3 of a “test your retinal cones” survey. The Garnet Star has become a favorite for 2015 viewers, as the dark amber/red color jumps out to everyone (no subtlety, or filters, to be found). * Alcor and Mizar in Ursa Major – A binaried binary, with one binary itself binary of binaries. Not only do you get to stare at six gravitationally-bound stars, but you get to explain the differences between optical, true, and spectroscopic binaries with a single shining example. * M57, The Ring Nebula in Lyra – Old amateur astronomers pride themselves in being able to discern all kinds of detail from dim, fuzzy objects. I tend to talk down the impressiveness of some objects to make sure new viewers spend a little extra time pulling detail out (we’re not Hubble, after all). Everyone present for the Ring saw the donut easily at low magnification and were happy to spend extra time giving another, even fainter look at high power (which made for a great part of the whole session in my book). * M13, The Globular Cluster in Hercules – Second only to Saturn in “woah” moments, M13 never disappoints visually. After you add a little bit about its size and history, several people insisted on taking another, more informed look at it. * M51, The Whirlpool Galaxy in Canes Venatici (but just-just off the handle of the Big Dipper in Ursa Major) – Just off the last handle star of the Big Dipper. I had one request to see something outside of the Milky Way. With the Andromeda Galaxy in the direction of Marcellus and Syracuse (and the night already getting long for many of the kids in attendance), I tested some eyesights (and imagination) on this faint pair of galactic cores in collision. * To that list we added one decent shooting star, just enough of the 300 billion other stars in the Milky Way to make out its cloudy band through Cygnus and down to Sagittarius, and one timed Iridium Flare (see below). 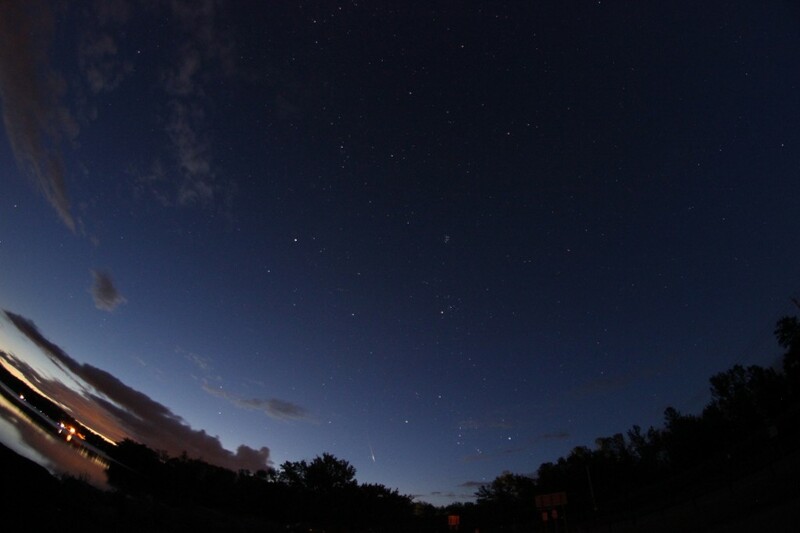 An 11:09 p.m. Iridium Flare caught below the bright star Arcturus (for the record, caught at its brighest first, so the satellite is going from the left to the right in the image). Click for a larger view. 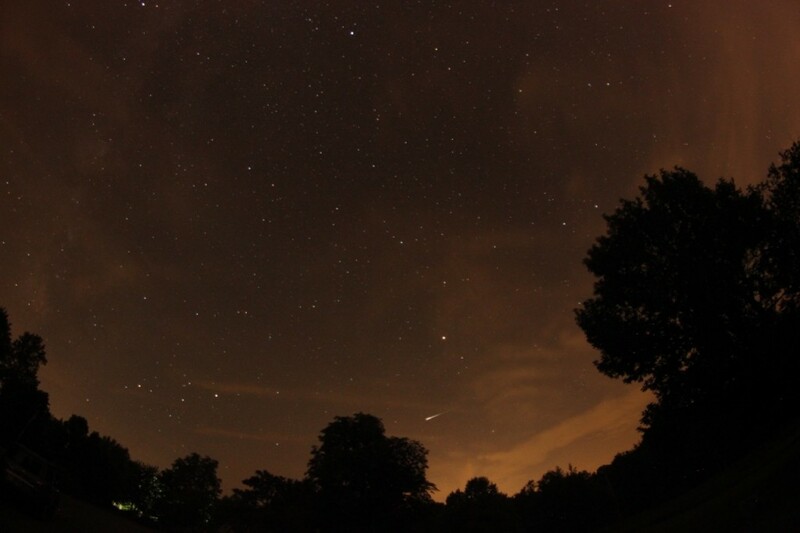 August has rapidly become a busy month for observing, with several sessions planned around the Perseid Meteor Shower. Keep track of the website for whether/weather announcements. We hope you can join us!